Bird watching in Canada is a favorite past time for thousands of people all over the world. It is no different right here in Merritt and the Nicola Valley. I Love birdwatching in Canada, and the Nicola Valley too. I do go out on occasion with some of our local Pros, like the great people at Nicola Valley Naturalists. When I do take that time, I am always amazed at the knowledge and at what they can spot and see! These nature and bird experts are amazing! I just happened to be doing what I love, which is being outdoors and exploring and this happened! It is like a gift! This is the real deal bird watching in Canada! I was sitting in my “Palace” my new to me, travel trailer (that I love BTW) and just outside on the lakeshore was this beautiful yellow, black and yellow bird! Camera time! I grab my Nikon and go sit in a chair close by waiting for the return! And “HE” did! This time with a baby! The baby bird started to sweetly hop around, first on the branches of the berry tree, and then onto the ground and rocks just below! All fuzzy and cute as a baby bird can be, I start snapping away! The little one was looking at me, looking around, waiting for daddy. Sure enough daddy comes back with some food! mushed up berries. Baby waits. Daddy hops to the ground and as you can see in the picture, this is what I saw! Isn’t this amazing? Anticipating for the right moments to take pictures, I was once again rewarded! Look who scurries over to see what is going on! The cutest chipmunk! 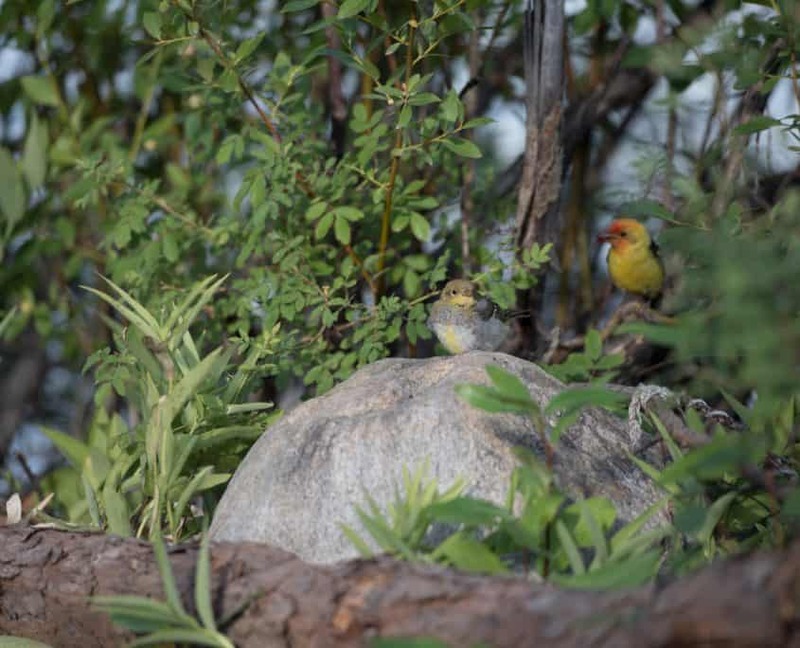 He sits calmly on the rock, back turned to the baby bird as if to say “I know your there but I don’t care!” Baby bird stating right back at him also seeming to say, “I know your there and I don’t care either.” Then they looked at each other. Both caught in a stare. They both sat still for a moment both as calm as could be. 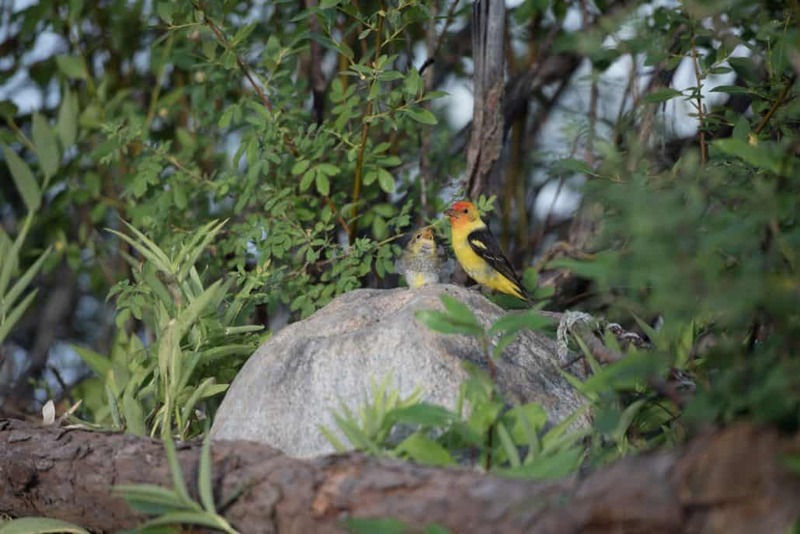 Thanks to All About Birds I was able to learn more about the Western Tanager and so many other species. All the information you will ever need for Bird watching in Canada. Here are some cool facts and other information I learned about this bird. A Male has an orange-red head, brilliant yellow body, and coal-black wings, back and tail. 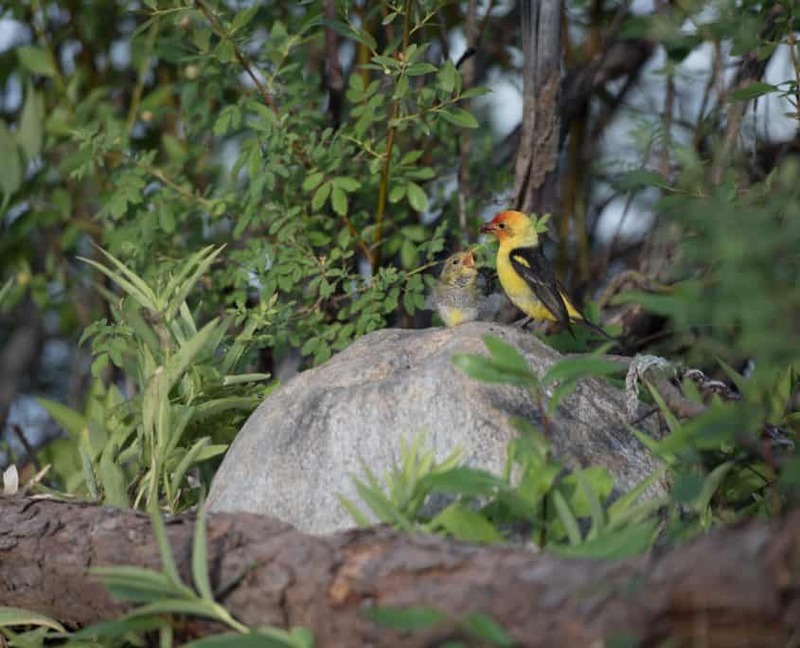 Females and younger ones are similar to the males but have somewhat of a dimmer yellow-green and black. These birds live in open woods all over the West, particularly among evergreens, where they often stay hidden in the canopy. Nevertheless, they’re a quintessential woodland denizen in summertime, where they fill the woods with their short, burry song and low, chuckling call notes. While most red birds owe their redness to a variety of plant pigments known as carotenoids, the Western Tanager gets it’s scarlet head feathers from a rare pigment called rhodoxanthin. Unable to make this substance in their own bodies, Western Tanagers probably obtain it from insects in their diet. This species ranges farther north than any other tanager, breeding northward to a latitude of 60 degrees—into Canada’s Northwest Territories. In the chilly northernmost reaches of their breeding range, Western Tanagers may spend as little as two months before migrating south. 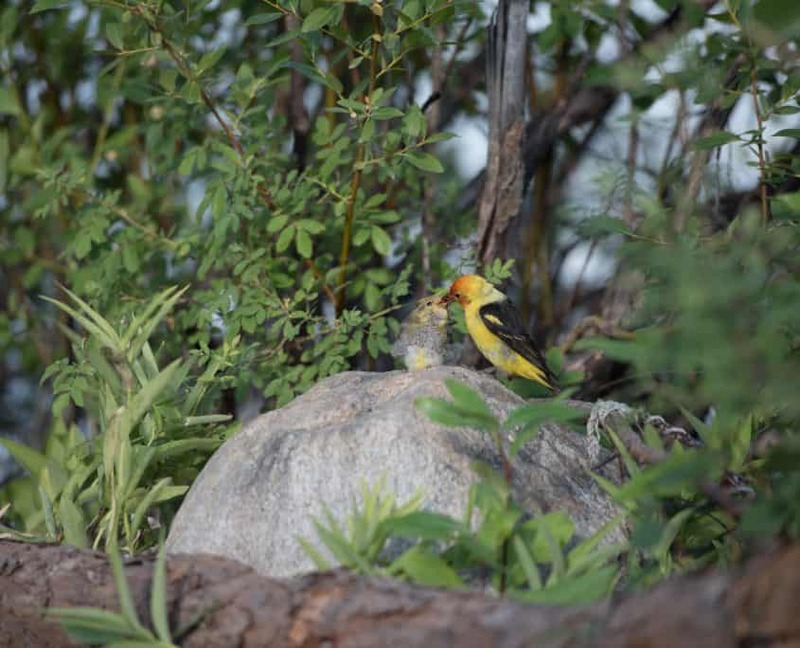 Male Western Tanagers sometimes perform an antic, eye-catching display, apparently a courtship ritual, in which they tumble past a female, their showy plumage flashing yellow and black. Around the turn of the twentieth century, Western Tanagers were thought to pose a significant threat to commercial fruit crops. One observer wrote that in 1896, “the damage done to cherries in one orchard was so great that the sales of the fruit which was left did not balance the bills paid out for poison and ammunition.” Today, it is illegal to shoot native birds and Western Tanagers are safer than they were a century ago. 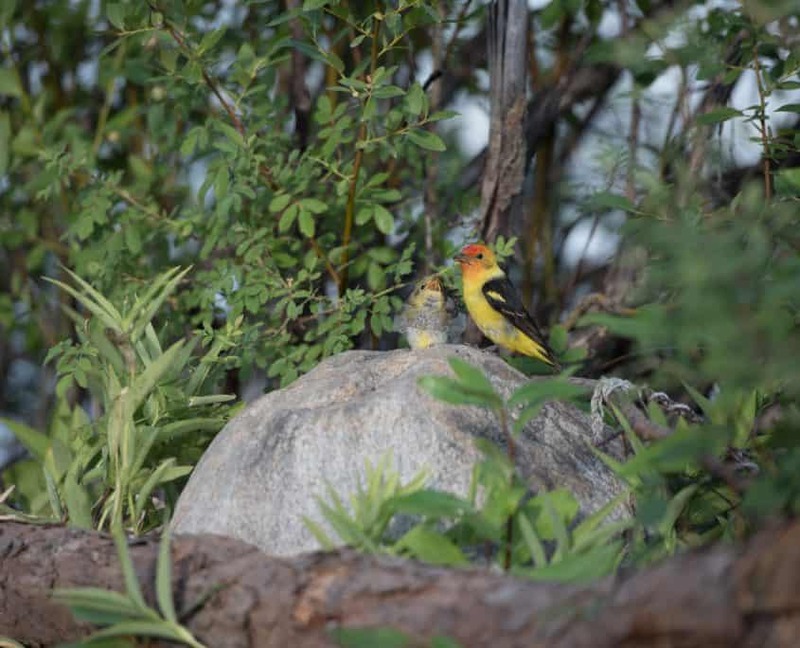 The oldest Western Tanager on record—a male originally banded in Nevada in 1965—had lived at least 6 years and 11 months by the time he was recaptured and rereleased during banding operations in Oregon in 1971. It was fantastic! I know I had a big smile on my face as I sat and watched these three, and I knew I was capturing a great photos. Here is additional images I captured that afternoon. Hope you enjoy looking at them as much as I enjoyed taking them. I have been able to spend enlightening times with our local experts at Nicola Valley Naturalists. They have wonderful friendly experts, and some great programs for everyone. They started a new one this year called Merritt Nature Kids! How cool is that? A major objective of Nicola Naturalist Society is to provide education and information on the wild organisms and ecosystems of the BC interior. Especially those that are found in the Nicola Valley area. They have regular meetings at the theatre at NVIT. (Nicola Valley Institue of Technology), and have all kinds of great field events like amphibian monitoring and the Christmas bird count. They can count me in for that one this year. You don’t have to be a birder to participate in the count. Join one of the best and historic bird watching in Canada events, just go. Bring a camera and binoculars and share with us what you see. Happy Bird watching in Canada and the rest of the world too!